Note: I posted an article about NSX Composer on VMware’s Consulting blog, and I thought it would be interesting to share it here. NSX is VMware’s solution to virtualize network and security for your software-defined data center. Inside NSX, the Service Composer is a built-in tool that defines a new model for consuming network and security services; it allows you to provision and assign firewall policies and security services to applications in real time in a virtual infrastructure. Security policies are assigned to groups of virtual machines, and the policy is automatically applied to new virtual machines as they are added to the group. 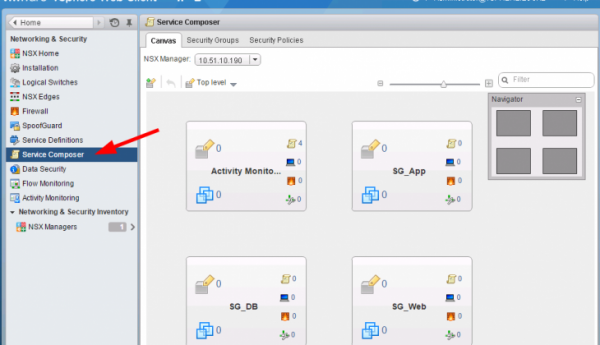 Read the complete article : Automating Security Policy Enforcement with NSX Service Composer. 1. Deployment: This used to mean 10 different ways to deploy 10 different security controls. Now there’s ONE way to deploy any security solution. Easier to train operators, more automated service insertion, less time. 2. Policy Consumption: In cloud environments, legacy security solutions still apply policy based on static constructs such as IP address. Furthermore, mapping multiple controls to the same apps means going to multiple consoles to figure out your effective policy on a workload. Think about the different consoles for firewall, IPS, antivirus file integrity monitoring, encryption, etc…. Now, you can define workload-centric (not IP-centric) policies, in one place, for multiple controls. Imagine picking from a ‘menu’ of pre-defined/approved policies (by security admins) and assigning to workloads (either manually, or through cloud automation tool). And when you need to troubleshoot or audit security policy for a workload or app, you don’t have to run around to 10 different consoles to figure out the effective policy. You just go to the workload itself and boom – the effective policy is clearly shown. But dynamically applying a policy to a workload requires point to point integrations between solutions (e.g. antivirus + firewall, vulnerability scanner + IPS). Now, through a lightweight mechanism of ‘tagging’ workloads, admins can dynamically apply policy changes. Look forward to seeing more discussion on this topic from your blog! How would you positioning the security policies firewall rules in comparison to regular nsx firewall rules? Regular nsx firewall rules have sections, security policies firewall rules have a weight. Should we mix them to get best out of both worlds or is it better to decide for one? What are other differences between them? Thank you for your comment Mario! An administrator can create different types of rules by using different constructs. To do security automation and intelligent grouping, the use of security policies helps to remove the need to constantly update your DFW rules when VMs (or other objects) are created or deleted. Depending on your infrastructure / design, you could for example use “normal” DFW rules for infrastructure and global security and the security policies to manage the application security (especially if you are provisioning multiple tenants or identical applications, for which the firewall rules are similar). The weight is only applied to control precedence between security policies (when multiple security policies are applied to the same security group or when VM are members of different security groups), so it’s not really the same as sections in the DFW. Hope this will help you, but don’t hesitate to develop if you need more information! Thank you Romain for your reply! 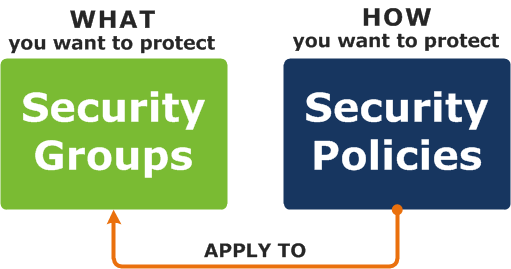 I see your point with the grouping and structureing capabilities of “security policies”. On the other hand using Security Groups directly in regular DFW rules gives you also the option to dynamically add/remove VMs without explicitly changing the DFW rules. When you have infrastructure and global security rules directly in the DFW, they are per default over-ruleing the “security policies” rules as default position of “security composer” rules is below user-specified rules in DFW. So, if a “security policies” tries to quarantine a infected workload it might not work when DFW rules allow outgoing traffic. I guess moving the “service composer” section arround in DFW could make the security composer and the DFW become inconsistent and you might be forced to use synchronize action. The policies weight as I understood it only controls the order of the generated DFW rules and in case of third-parties the port number in IOchains. I am still having a hard time to find a smart mix of the two approaches. Is it possible to change the default position of service composer rules so that we can move the service composer created rules above the user-specified DFW rules?